(Bloomberg) -- Argentina’s largest province is in talks with banks to get as much as $500 million in a repo loan, according to people with knowledge of the matter. The Province of Buenos Aires is discussing the loan with international banks following three similar deals done by the Argentine federal government, said one of the people, who declined to be named as the talks are private. The province will likely have to pay a rate of Libor plus 650 basis points, higher than what was paid by the national government, which in February raised $2.25 billion in three 24-month credit lines at a rate of Libor plus 550 basis points. Province officials are studying the offer, which was pitched by banks among other options, a second person said. The final interest rate will depend on how many banks participate in the deal and the size of the collateral. The loan may be cut to $300 million. 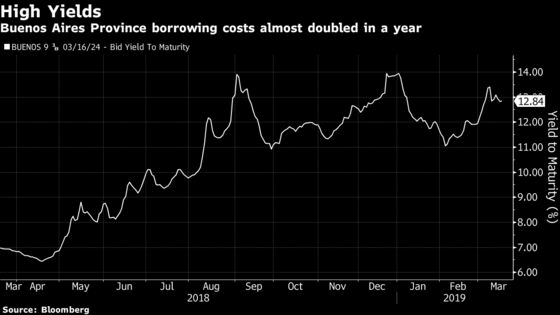 The deal comes as Argentine sovereign and quasi sovereign issuers turn to repo loans backed by collateral bonds amid high borrowing costs. The extra yield investors demand to hold Argentine bonds instead of U.S. Treasuries, a key gauge of investor sentiment, has more than doubled in the last year, according to a JPMorgan Chase & Co. index. A repurchase agreement, or repo, is a form of short-term borrowing for traders of debt in which the bank sells securities backed by bonds and buys them back at a later point. The price of Buenos Aires’ $1.25 billion of bonds due in 2024 slipped 1 cent to 85.5 cents on the dollar on Monday, implying that new investors are rewarded a 12.84 percent. The province is authorized to raise 68.5 billion of pesos ($1.7 billion) in the credit markets, a province spokesman said by phone. He had no immediate comments on the repo loan.